In the December 2017 OwlCrate Box, Emma Mills’ Foolish Hearts was the book choice. Though the thought of buying this book would’ve crossed my mind, I most likely would’ve never purchased it. Unfortunately, I carry a bad stigma towards romance novels…and books set with character 10 years younger than me…I tend to find them unrelatable. HOWEVER, I’ve been recently looking for a lighthearted novel and figured this was a good choice. Luckily, I was right. Emma Mills’ Foolish Hearts is a heartwarming and funny story, wonderfully discussing the highs and lows of falling in love and creating new friendships. Though the plot’s predictable, there’s something very beautiful about her story and the way she writes, making it impossible to put the book down. Mills’ Foolish Hearts weaves a VAST VARIETY of themes into the plot: high school romance, coming of age, self discovery, the bond of friendship, learning to let go, self-confidence, and the importance of accepting change. Claudia, our main heroine, is on a quest to discover all of these themes above – talk about some MAJOR enlightenment’s in her senior year. With some online gaming and boy band fangirling mixed into the plot, these little additions to the story make it even more enjoyable and relatable to young readers. The endearing thing about this novel is that there aren’t these EXTREME things that happen to the characters; it’s simply a story about what it’s like to discover life’s not stagnant but rather in constant motion and full of twists. What do you do to cope with this? How do you move on from things in your past? How does one learn to let go and grow? It’s a novel that I personally believe a lot of teens (and even us young adults) can relate to. Yes, it’s great to have books that discuss darker and more serious content; it makes us less ignorant of the world. However, it’s also good to let readers know that your life doesn’t have to be in extreme and utter chaos to still feel sad and lonely and confused. Sometimes, our mundane lives can cause us anxiety and inner turmoil…and that’s okay. We have to learn to stop comparing ourselves to others’ lives and let ourselves just be. Sad, happy, mad, tense…whatever YOU need to be. The reason for the 4 cups of tea? The plot was EXTREMELY predictable…that’s bad coming from me, who’s completely oblivious to the majority of things in life, let alone in literature. But in this instance, I didn’t mind the predictability factor. There are many characters in Foolish Hearts, introducing a wide array of personality types that readers will both love and despise. Claudia and Iris are the main two characters, with the narration taking place in Claudia’s point of view. Claudia’s socially awkward and kind of a wallflower; the difference between her and a wallflower though is she’s able to connect with others fairly well and feels as though she belongs when it comes to her best friend Zoe. Claudia struggles a lot with change and confidence, feeling as though she’s simply regular rather than someone unique or special; this inner turmoil is her biggest challenge to face during the course of the novel. She’s a really cool character, being a lover of massively multiplayer online role-playing game’s (mmorpg’s) and incredibly witty-sarcastic humour. If you want a character that’s easy to love, this book’s definitely for you. Iris is a very headstrong and ruthless and ill-mannered, making it really hard for her to connect with most of the people in her school. For Iris, it’s extremely hard for her to get along with others and not act selfish; fortunately though, she recognizes this flaw and is able to grow as a person into someone more trusting and caring. Slowly throughout the novel, Iris is able to not only confide in Claudia, but she’s able to eventually call her a friend. A wonderful element about this novel is that the majority of characters are going through some struggle, giving readers the ability to relate to at least one of them. Though not all the characters solve their issues by the end of the story, there’s still an immense amount of growth from them. Following Claudia’s point of view, I found Mills was able to truly capture her persona in the words on the page. You FEEL as though you’re in her head, making you feel for her more throughout the story. The dialogue-to-paragraph ratio is fairly even, giving you a great amount of detail into Claudia’s thoughts in addition to getting a good vibe of what’s going on plot wise beyond Claudia. Originally, I was going to rate this 3 cups of tea. It’s a wonderful book, but I wasn’t sure it was really worth higher than that. After pondering for a bit though, it felt like a betrayal to rank this any lower than 4 cups of tea. It’s hilarious, incredibly adorable, touching, and just full of lovable characters. Yes, the plots incredibly predictable; if you don’t like that, this may not be the book for you. 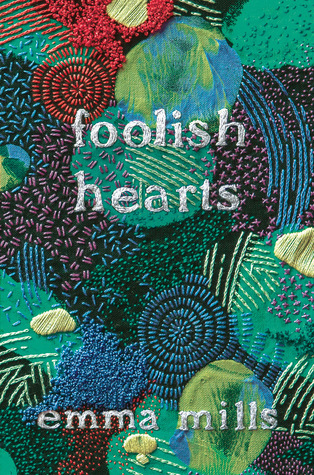 But if you are willing to move beyond that and are looking for a feel good novel that’s sure to make you smile, Mills’ Foolish Hearts is a fantastic choice to distract yourself from the world for a little while. Will you give Foolish Hearts a chance? Lovely review!! I also rated it 4 stars, but I agree with your rating, it wasn’t *exactly* 4 stars, thinking critically about it, but I enjoyed it at a 4 star level. It was so cute and fun. That’s EXACTLY how I felt; I’m glad I’m not the only one you had some mix feelings about it haha! It was SUPER adorable; it was exactly what I needed recently…just a nice light read 😊 I’m glad you enjoyed it as well! I feel you! I didn’t think I would enjoy this either but I’m so glad I decided to give it a go!